By now, most everyone has read a myriad of of opinions, blogs, message boards and news stories on Mario Lemieux's statement regarding the aftermath of an ugly, incident-filled, mauling of his Pittsburgh Penguins at the hands of the New York Islanders. Garnering even more attention, has been the backlash by fans, players and media members concerning Lemieux's statement. If by some chance you missed it click here. The "unacceptable and embarrassing" actions that Lemieux was referring to no doubt included the Islanders’ Matt Martin sucker-punching an unaware Max Talbot, Islanders’ Michael Haley, lauching himself at Talbot and then Penguins goalie Brent Johnson; and no doubt Trevor Gillies elbowing of Penguins’ Eric Tangradi in the head, who continued to punch him while Tangadi lay prone on the ice, then shouted at and mocked him as Gilles was forced off the ice surface. Lemieux's comments were harsh to be sure, however, the backlash did not come from the NHL, at which his comments were directed, but from elsewhere. NHL Commissioner Gary Bettman, chose to take no action against Lemieux, and stated that the comments would not be discussed or debated publicly. Yet, that did not give Lemieux any reprieve from the likes of the Edmonton Journal, Don Cherry, Zenon Konopka, Jeremy Roenick or countless fans and bloggers. 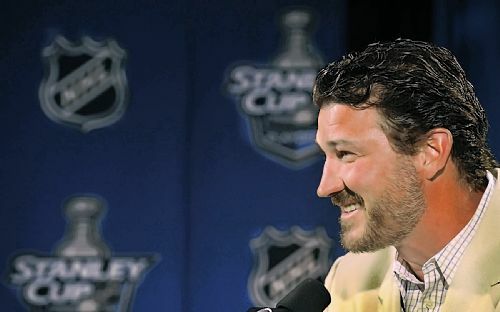 Most of Lemieux's critics thought his comments were ill-timed or overly dramatic, but the word that crept up over and over was "hypocritical". Paraphrasing: Cherry doesn't understand why Lemieux was OK with Brent Johnson knocking Rick DiPietro's lights out, and that Matt Cooke works for Lemieux and never criticizes him. You don't even have to watch the video to know that Don Cherry is a moron, so we won't waste our time enumerating every nonsensical comment, but some of his arguments were made elsewhere. Many outlets made references to Cooke, Goddard leaving the bench to fight Michael Haley, Johnson hurting DiPietro in a fight a few days prior, and how the Penguins lead the league in penalty minutes and fighting majors. Now, do you have to agree with Lemieux's statement? No. I'm not sure that I do. Can you accuse him of not having the best timing and being reactionary? However, the criticism that he received was not about these issues. Repeatedly, we read the same unscientific accusation that sought evidence to support a pre-conceived notion, not the other way around. First, the point that because the Penguins lead the NHL in fighting majors and Johnson's breaking the face of DiPietro, Lemieux has no grounds for argument. These are weak and ill-conceived concepts. Fighting is part of the game. It always has been and always will be. Most fights are for spark or retalition of liberties taken on another player within the confines of a game. Lemieux made no statement regarding fighting. What we are sure he didn't like, was much of the violence in this game was a premeditated foolish display in response to DiPietro's misfortune in a consensual skirmish. Regarding the other idea of Lemieux being a "hypocrite" as long as he employs Matt Cooke. This will assuredly be a topic of debate, but the facts win out over heart-felt opinion. Cooke's history and the incidents that occurred during the game in question are completely unrelated. Regardless of how you view Matt Cooke, you won't find tape of him attacking goaltenders, throwing shots at a player, hitting him while he is down, and then taunting him afterward. You won't find evidence of him sucker punching anyone, anywhere. Sure he makes questionable safety decisions. You can reasonably accuse Cooke of not respecting other players. Granted, his propensity for knee on knee collisions happen far too often to be excused, but they happen no more frequently than Alex Ovechkin's. His latest suspension was a result of an unnecessary hit on Fedor Tyutin, not a dirty one. Cooke has a record for questionable and dangerous decisions, but his rap sheet does not include a single incident that is in line with Gilles', Haley's or Martin's. Public opinion is just that, opinion. Many times evidence, facts or reality have little to nothing to do with the formation of these opinions/criticisms. The criticism of Mario Lemieux is no exception.